The movement that would eventually lead to women’s suffrage had already become well established before the outbreak of war in 1914. Even so this movement had a long way to go and many hurdles to overcome before the role, position, freedom and standards of living of women in society and in the work-place would be significantly improved. The necessities and experiences of world War I removed many of these hurdles. Some women worked before World War One, but generally only in jobs traditionally associated with their gender. This for the lower classes included working on farms and in industries associated with the clothing trade. Women in the middle and upper classes seldom had any requirement or outlet to work at all other than in respectable positions as nurses, or teachers. Virtually no women worked in skilled posts that required technical expertise, payment was significantly lower than it was for men and there was little prospect of establishing a career. Marriage and the subsequent necessity to bring up their children usually ended a woman’s working life. By late 1915 Britain had undergone a massed mobilisation with conscription channelling most of the able bodied men into the armed forces to meet the demands of a modern technological war and to make up for the appalling casualties that were being suffered. This drain on men of working age from the land and industries that fed the war effort with raw materials and military hardware could not be sustained without replacing them. Without a workforce to staff farms, factories and crucial services such as transport and clerical posts, the British war effort would have collapsed. By 1916 it had become apparent that (however reluctant that Government and Society in general was to accept it) Women would have to work in Britain’s crucial war industries and that they would have to be trained to perform, and be paid for, skilled and often dangerous roles to do it. Women were therefore employed in unprecedented numbers in Britain’s munitions industries and also became a common sight driving buses and trams. In the same year The British Legion began to recruit women to serve in voluntary roles in the armed forces, initially as clerks and drivers for the Women’s Auxiliary Army Corps (WAAC) and the Women’s Legion Auxiliary. In 1917 groups from the Women’s Legion Auxiliary were also being employed to help fulfil the needs of the Royal Flying Corps (RFC) for drivers, and clerks and so release men performing these roles in England for service in Flanders. In September 1917, one such group of women was posted to serve at RFC Suttons Farm as drivers, despatch riders, clerks and telephonists. In addition to acting as drivers and despatch riders these women were also responsible for the day to day care and maintenance of their vehicles. Initially the women of the Women’s Auxilliary Legion at Suttons Farm were billeted on a local farmhouse some distance from the aerodrome but were soon moved to a specially built women’s accommodation just outside the aerodrome gates. The footings of this range of now demolished buildings are still partly visible in the scrub land to the north of the car park in the north of the park area. On April 1st 1918 the Royal Flying Corps (RFC) and Royal Naval Air Service (RNAS) were amalgamated to form the Royal Air Force (RAF). At the same time the Womens Royal Air Force (WRAF) was formed out of the existing voluntary forces. In addition to their roles as drivers and clerks women in the WRAF were now also given the chance to learn the highly skilled trades of becoming aircraft riggers and mechanics. Many women from all roles of life immediately seized this chance to learn a profession that had been previously barred to them. By the end of the war there were almost 25,000 women in the WRAF. These women performed a number of roles including mechanics, fitters, armourers, electricians, radio and telegraph operators, balloon operators clerks and drivers as well as more traditional roles such as cooks. Twenty Four of these served at RFC Suttons Farm. After the armistice the armed forces haemorrhaged men eager to return to civilian life. This led to a shortage of trained personnel overseas in France and occupied Germany which was for a short time filled ably by members of the WRAF. 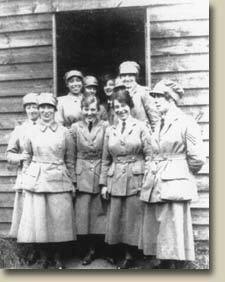 Even so the rapid run down of the e armed forces led to the WRAF being disbanded on April 1st 1920. World War I changed many things. Amongst these was the regard with which women were viewed in society and the roles that society was willing for them to take. Women had finally been given the vote in Britain in 1918 and it was no longer seen as completely alien for a woman to have a job or a career in a skilled profession. During the 1920’s this first taste of liberation was reflected at least for the middle and upper classes in new fashions including the wearing of trousers and skirts with steadily rising hemlines. The aviation and exploration bug was also caught by some privileged women and there were a number of famous female aviators who made a name for themselves in the inter war years. One of these, Jean Batten a round the world flyer, was a prime attraction at the RAF Hornchurch Empire Air Day in 1938. By 1939, as another World war loomed, women were already volunteering to serve in support services including the Auxiliary Fire and Ambulance Services. Unlike during World War I, there was virtually no opposition to this and just before the outbreak of World War II the Women’s Auxiliary Air Force (WAAF) was formed. The WAAF at War. 1939-1945. On the outbreak of war in September 1939 the WAAF numbered approximately 2,000 staff no where near the number that would be required. A recruiting drive delivered spectacular results and by 1943 the WAAF numbered nearly 200,000. Britain was very quick to try and integrate women into its war effort, especially compared to Germany which resisted any such measures until defeat was looming in 1944. Even more so than in World War I these women were called upon to perform an exceedingly varied and often very skilled suite of roles. as in World War Women were, therefore trained as mechanics, armourers, fitters, riggers, electricains, drivers and clerks as well as cooks and supporting administrative roles. New and strategically vital roles were, also however opened to the women of the WAAF. Amongst these were the demanding roles of acting as radar operators and plotters as well as serving in other intelligence roles such as aerial photographic interpretation, meteorological recording and prediction and code breaking. One area in which women serving in the WAAF were still barred from, however was flying although a civilian formation, the Air Transport Auxiliary (ATA) was formed to provide female ferry pilots to move aircraft from factories to air bases. The role that the WAAF is probably best remembered for during World War II is in providing the staff for Britains radar and control system. Their work in quickly interpreting radar plots and directing fighters onto in coming raids was to be a crucial element in giving the RAF victory over the Luftwaffe during the battle of Britain. Later these radar operators and plotters would also co-ordinate Britain’s night fighter defences and even spoof the German air defences during the allied bombing offensives over Europe. RAF Hornchurch as a sector control station had one of the most important air battle control centres in the country during the Battle of Britain. At first this was actually located at RAF Hornchurch but the bombings of August 1940 resulted in it being moved to a safer location at Romford. The RAF Hornchurch Sector Control remained operational until 1944. The role that women played in both World Wars established beyond doubt to many that women were equally capable as men in performing the majority of tasks and in some roles such as radar plotting and air photo interpretation actually excelled. To many it was now self evident that women could achieve success in almost any profession that they chose and that their place was not necessarily just as home makers.